There was very little celebration that first Easter morning. As Christians around the globe prepare to celebrate the resurrection of Jesus in a few days time, I was struck by the contrast with that first Easter morning. We are right to sing, to dance, to shout ‘He is risen indeed!’ Yet, I wonder what our Easter services would be like if we experienced them more like Mary, Peter, and John did. 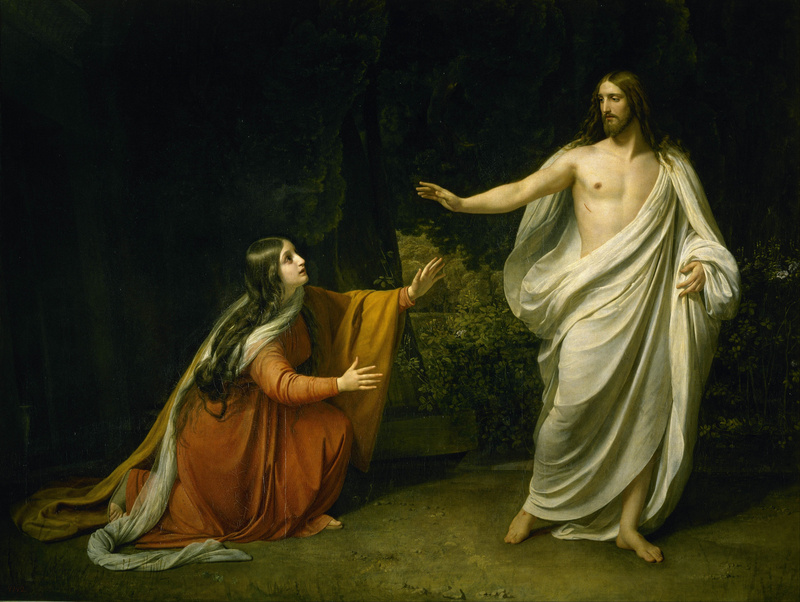 Mary Magdalene came to the tomb before sunrise, only to find the stone rolled away. Anxious and fearful, she runs back to the disciples and claims the body has been stolen. Then Peter and the beloved disciple run back to the tomb to find her story seems to be true. The stone is gone and so is the body, but curiously the linen wrappings remain (and are folded nicely). No hymns of praise. No shouts of ‘He lives.’ Simple confusion. With the fact in front of Mary’s face, she reasonably assumes Jesus’ tomb has been robbed. Easter morning begins with jumbled, unpleasant emotions. The disciples return home, but Mary remains crying. She peers into the tomb, tears streaming down her face, only to find two angels in white sitting beside the spot Jesus’ body had been laid. When most people encounter angels, they fall down in fear. In the Bible, angels frequently tell people not to be afraid, but not Mary. They ask her why she is crying and she answers. Her distress at the loss of Jesus overwhelms even the fear she might normally have experienced at the appearance of an angel. She turns around and sees Jesus. Only she doesn’t see him. She thinks she is seeing a gardener and then pours out her dilemma before him. “Sir, if you have carried him away, tell me where you have put him, and I will get him.” Then, finally, the good news of Easter pokes through. She turned toward him and called out in Aramaic, “Rabboni” (which means Teacher). It is only when Jesus names Mary that the light of Easter breaks through. The Easter story began in darkness and confusion. Literally, it began before the break of day. Spiritually, the story begins with shock and fear. No one remembers or believes that Jesus rose as he said he would. They fear the worst that is humanly possible. None see what God made not only possible, but actual by raising Jesus from the dead. Even when Mary comes face-to-face with Jesus, she cannot see him. She cries. The disciples race. But no one celebrates until Jesus says her name. I wonder what it would be like if our Easter services captured some of the emotion of this first Easter. I wonder what it would be like to be bewildered again by the story that the tomb is empty. To find myself so convinced of the physical reality of the empty tomb and the risen Jesus that I feel the shock. Could this be true? Could it really have happened? I wonder what it would be like if our Easter services captured some of what it must have been like for Mary to hear Jesus speak her name. To go from fear and trembling, anxiety and worry, to hearing Jesus say your name and then see him right before you. I wonder what it would be like to wake up Easter morning and hear Jesus call my name. So true, we look over those first impressions. We are way to hard on Thomas. All the disciples had trouble believing before seeing. So do we and then He calls our name, what incredible joy.